Yerba Mate bursting with apples and cinnamon. 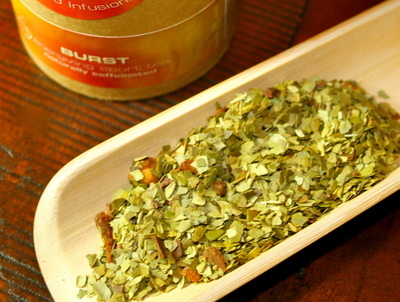 Energizing Sport Tea contains yerba mate, a South American herb known for its plethora of health benefits. A study of yerba mate at The Pasteur Institute and the Paris Scientific society in 1964 concluded that mate contains “practically all of the vitamins necessary to sustain life.” Mate is also a natural source of caffeine, theobromine (dark chocolate’s euphoric stimulant) and theophylline (tea’s soothing stimulant) which stimulate the central nervous system to create calm energy and mental clarity. ingredients: yerba mate, apple, cinnamon, natural apple & cinnamon flavors. But, so much for that! This is really good! The apple and cinnamon are very fragrant, and I can smell them as the cup sits in front of me and the aroma wafts from the cup. It smells like apple pie! Not a smell that you think of when you think “Energizing Sports Tea”! And the flavor is just as abundant as the scent. The apple and cinnamon are in good balance. The cinnamon is not that hot, spicy cinnamon, it is a sweeter tasting cinnamon that accents the apple very nicely. The apple tastes sweet and smooth. It’s a bit like a lightly spiced apple cider! This is the first Yerba Maté blend that I can recall tasting and not immediately identifying as Yerba Maté based only on the taste. It does not possess that rather pungent, earthy taste that is so synonymous with Yerba Maté (at least, for me). That is not to say that I cannot taste the Yerba Maté base, because it’s there, it’s just not that bracingly apparent Yerba Maté taste. I really like this. It is one that would work nicely as a iced tea as well as a hot one, and it has a certain autumnal charm to it which makes it very lovely for this time of year. This is the first tea that I’ve had the opportunity to try from Teaquilibrium, and based upon this very positive experience, it shall not be my last!